The new ARC CBBC lab room at hub location Utrecht is ready to be furnished. We can now start to equip our first labs. They will be finished at the end of the year, ready for use by our new PhD students and postdocs, some of whom have already started their work in ARC CBBC’s bilateral projects. The first lab that has been especially designed for use by ARC CBBC was turned over by the Utrecht University Real Estate department, that has been responsible for constructing the building. On 15 March, during a small kick-off ceremony at the swept clean 4th floor of the GML building, two faculty directors of Utrecht University received the authority to hand the room over to ARC CBBC. They represented the users of the building. 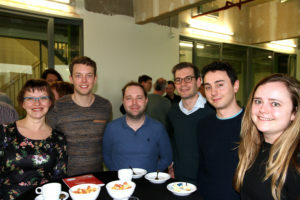 It all happened in the presence of some new ARC CBBC employees: the first senior lab technician, several new PhD students and our first postdoc, the scientific director and some colleagues of the ARC CBBC support office. Furthermore, all other new users of the Geo Milieu Lab (GML), as the building has been called, were invited. Those organisations are Utrecht University Geosciences, and private research institutes Deltares and TNO. ARC CBBC’s senior lab technician Hannie van Berlo-van den Broek (left) with other ARC CBBC colleagues.